"Nurse Portrait B - 1" by Normadeane Armstrong Ph.D, A.N.P. 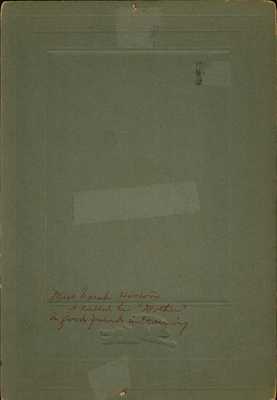 Back of matted photograph of a Nurse. Presumed to be Miss Sarah Harloins. The message in red ink reads: "Miss Sarah Harloins I called her "mother," a good friend in training."